If you ever needed a sign of Yorkville’s culinary credentials, look no further than Sofia restaurant, Christine Mast’s swanky new Italian – the Toronto-based chef is checking all the boxes when it comes to setting, ambience and menu. Particular applause, please, for local outfit Studio Munge which created a sophisticated progression of spaces, beginning with a foyer lined with rich red wall panels and black and white marble. 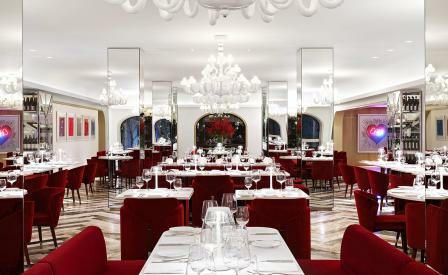 This leads into a lounge inspired by Italian art deco which is anchored by a circular bar wrapped in leather, and eventually into a dining room whose dimensions are exaggerated by rectangular columns clad in mirrors and a dozen Barovier & Toso chandeliers, alongside tables topped with Rosso Levanto stone. And with the city bathed in summer sun, the south-facing garden makes for a louche pit-stop with a pre-prandial Negroni spiked with limoncello. In the Sofia kitchen, Mast masterminds a smart menu that blends Italian standards with modern flourishes – think Sardinian flatbreads topped with mozzarella and fava; spot prawns paired with melon, cucumber and dill; zucchini flowers stuffed with crab and truffles; coffee-scented duck breast; and Florentine steak warmed with Calabrian chili and lemon. Desserts are equally imaginative, not least the clementine semolina cake draped with basil cream.